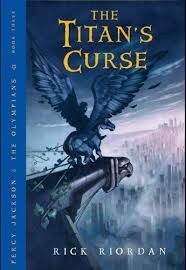 In the beginning of Percy Jackson's third adventure he must find two half-bloods at a military school named Nico and Bianca. Annabeth, Percy, and Thalia find Grover at the school. They soon find out Dr. Thorn is a monster and they must defeat him to get to Nico and Bianca. Thalia, Grover, and Annabeth run off while Percy runs after Dr. Thorn. Percy tried to defeat Dr. Torn but failed. The rest of the group tires to help Percy in the woods but soon hunters appear and also try to help. The monster falls off the cliff with Annabeth on his back. Percy is miserable and blames himself. After an argument between Zoé and Thalia the group and hunters head back to camp Half-Blood without the hunter's leader Godess of the maidens. Zoé and Percy have dreams of the godess and Annabeth in trouble. Percy tires to get answers from the Oracle but gets nothing. The oracle wanders out of the attic to Zoé after capture the flag and gives them a quest to find the godess. Percy was not accepted to go and soon gets Blackjack and follows the can they are taking. Mr. D soon realizes Percy is gone and allows him to go on the quest after a talk. They travel through a forge and to the garden where a dragon lies. Some are killed and some have risen to the stars. Find out who falls in THEIR final battle. This book keeps you on your toes and never is a bore in my mind. It shows how two different types of "society" can work together. How when someone falls you grieve but continue your quest without forgetting them and what they did to help you. 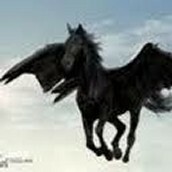 Percy's flying horse that helped him on his journey from time to time. They must pass through to continue their journey to the Titan army's hideout. Where the Titan's army is hiding.